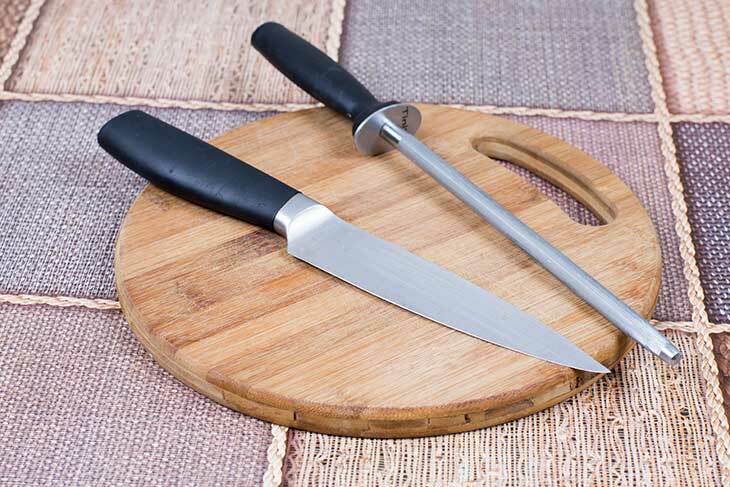 Whether you’re an amateur or a professional chef, having sharp knives is extremely important. 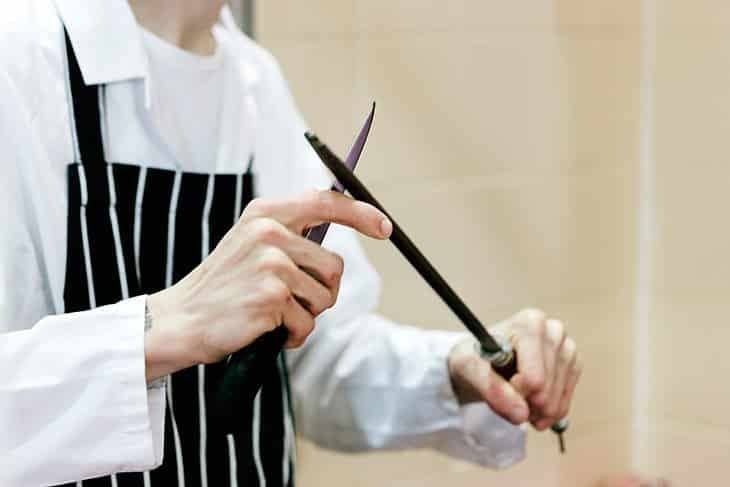 There are a lot of tools out there to help get your knives in tiptop shape but in my experience, I would have to say that having the best sharpening steel is an essential. However, you shouldn’t mistake a sharpening steel for a sharpening stone. Sharpening steels keep the edges of the knives blade so they cannot sharpen dull knives. Most knife sets include a sharpening steel because it is a preventive tool to ensure that your knives would never go dull. However, if you were like me when I started living alone you probably didn’t buy knife sets because they’re quite pricey and you won’t really see the need for all those knives (but you’ll soon find out that having more than one knife is essential!). No knife set usually means that you’ll need to get a sharpening steel on your own. Below I have listed what I think are the best sharpening steels in the market as well as some tips that will help you have the sharpest and most efficient knives. This steel sharpener from Winware has a plastic handle that is 5 inches long. This would allow you to have enough space to hold your steel sharpener anywhere you feel the most comfortable. So you won’t have a limited hold. You also have a choice between getting a 12-inch sharpener or a 14-inch. This makes it more customizable for you and you can easily choose depending on the size of your knives. The rod is easy to clean. You just need to use a damp cloth to wipe since dirt doesn’t easily get attached to the rod. It has a loop on the handle for easy storage. This would allow you to hang your sharpener instead of keeping it inside a drawer. It is a heavy duty sharpener that gives you great value for its price point. It is also very durable. The handle is made of plastic so it’s not as sturdy. The plastic also makes it not as comfortable as the other steel sharpeners. It’s on the heavier side compared to others. This Wusthof sharpening steel is a great choice for those who wouldn’t mind spending a little extra on their tools. It’s a 10-inch sharpening steel which has a magnetic strip which attracts metal alloys. This great feature would help in shaving off all those impurities on your knife by attracting every last metal that could make your knife dull. This metal sharpener’s handle is also great. It has a non-slip grip which makes it safer to use and ensures that there are no accidents while you’re using it. Aside from this, the handle also has a loop on the end so you can easily hang it for hassle-free storage. The rod has a magnetic strip to get every last bit of impurity off your knife. It has a non-slip handle which lowers the chances of it slipping off your fingers. This also makes it more comfortable for you to use so there would be no redness on your hands. It’s only 10 inches long. This limits the variety of the knives you can sharpen with this. This steel sharpener is relatively pricier when compared to its counterparts. This Wiltek sharpening steel is great for professionals and for those who have more than one type of knife in their kitchen drawer. Its 12-inch rod is diamond coated which means that it can sharpen even a butcher’s knife. The handle has a non-slip grip and it also has an added safety feature: a stainless steel ring. This would give you more control of your steel sharpener. This would make it more comfortable for you to use. It has a non-slip grip handle making it both safe and extremely comfortable to use. Although it is diamond coated, it’s not as expensive as others of the same type. It has a 2-year warranty; which I haven’t seen in any of the other steel sharpeners on the market. It doesn’t have the same durability as the others I have tried. In fact, mine broke after just a couple of month of usage. You need to really be gentle when using this because it can easily damage your knife instead of doing any good to it. Oxo is a brand which is really popular when it comes to kitchen tools so it’s no wonder that it’s sharpening steel is also on this list. This has a soft comfortable grip making it easy for you to use your steel without worrying about it slipping off your hands or causing any marks or redness. It’s also made with the right dimensions for it to not only be durable but also have that balance for the best sharpened knives. It has a comfortable grip which makes sharpening my knife easier, safer, and more comfortable. The make and dimensions give it great balance. The customer service of Oxo is amazing and you’ll get answers to any of your queries or complaints, ASAP. It’s easy to clean. Just use dishwashing soap and water, and you are good to go. The handles of my sharpener fell off after continuous use. This Smith’s steel sharpener has a unique design. Instead of the usual circular rod, this one is oval. This was not done purely for aesthetics but it actually is for functionality since the oval design provides a wider surface for sharpening. Aside from this, it has a flat end which gives you stability when you place the sharpener on top of your counter. This also lessens the possibility that your counter would get damaged. It is diamond coated making it more versatile, so I can sharpen numerous types of knives with a single sharpener. It has an oval rod design which provides a larger area when I sharpen. The handles have easy grip and non-slip features which makes it a safe and comfortable choice. It has diamond stones on the rod which actually takes off more metal than necessary. This damages your knife in the long run. With prolonged use, it actually becomes less effective so I wouldn’t recommend this for those who would be using it frequently. 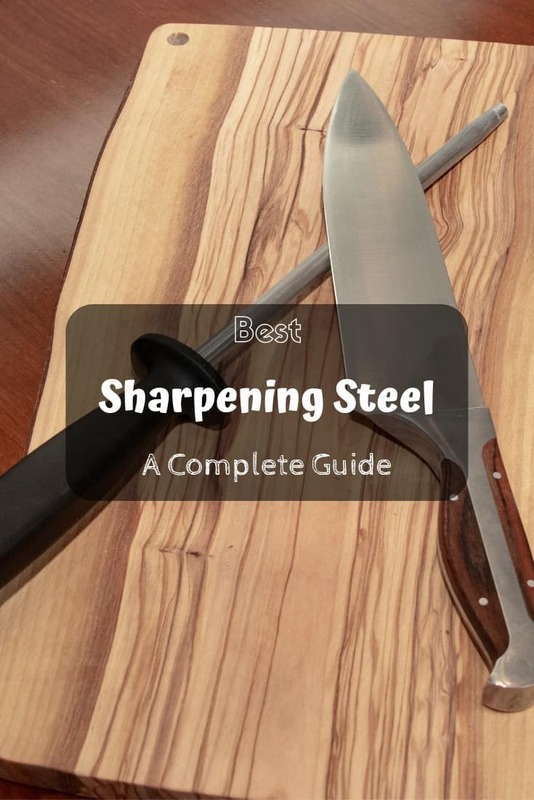 Best sharpening steel – top 5 reviews and a complete guide! The material of the rod would dictate how sharp your knife will be after using it. Of course, the type of material your rod should be would also depend on the type of knife that you have. There are three typical materials used for the rod: 1.) steel; 2.) diamond; and 3.) ceramic. The steel rods would be best for those who will be sharpening their knives regularly. As for those who have butcher’s knives, the diamond material would be best for you. Lastly, the ceramic rod would also be great for regular sharpening but it’s not as durable as the other two so it’s prone to breakage. With every tool that you will use, you should put a high premium on how safe it will be for you to use. Safety now goes hand in hand with whether or not it was designed ergonomically. This means that your rod should have anti-slip handles and rubber grip. The non-slip handles would ensure that your steel sharpener won’t suddenly fly out of your hands while you’re using it. The rubber grips would make it more comfortable for you to use. These would help you avoid having those red marks on your hands which is such a pain especially if you have sensitive hands. I know the thing that most people dread the most with cooking is the cleaning part. So why get a steel sharpener which will just add to your burden? The best steel sharpeners can be thoroughly cleaned with just wiping it with a cloth. This means that the steel doesn’t allow for any food particles to get stuck on it. This feature also shows that your steel would not be a food hazard since it would not have any old food particles stuck on it. Unlike with other things, size does matter with steel sharpeners. The length of your steel sharpener would dictate how well you’ll be sharpening your knives. It will also limit the length of the knife that you’ll be able to sharpen. Think of your steel sharpener as a runway in an airport, the longer the runway is the better the results. Getting a steel sharpener which is heavy-duty and not lightweight will also be ideal. The more heavy-duty your steel sharpener is, the less vulnerable it is to breakage. However, heavy-duty doesn’t mean that it should be heavyweight. You should also consider that having a heavy sharpener in terms of weight will cause you to have less control over your sharpener. 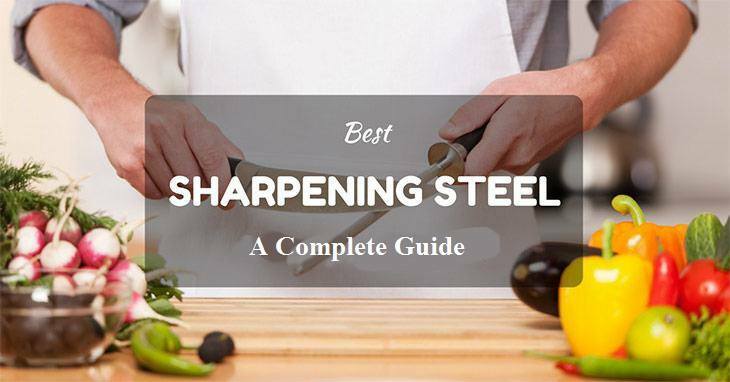 Knowing how to use your steel sharpener is the key to having perfectly sharpened knives. First, you should place your steel vertically on top of your chopping board. Afterwards, you have to angle your steel in a comfortable position for you to maneuver with your knife. Once this is done, you may now get your knife to start sharpening. 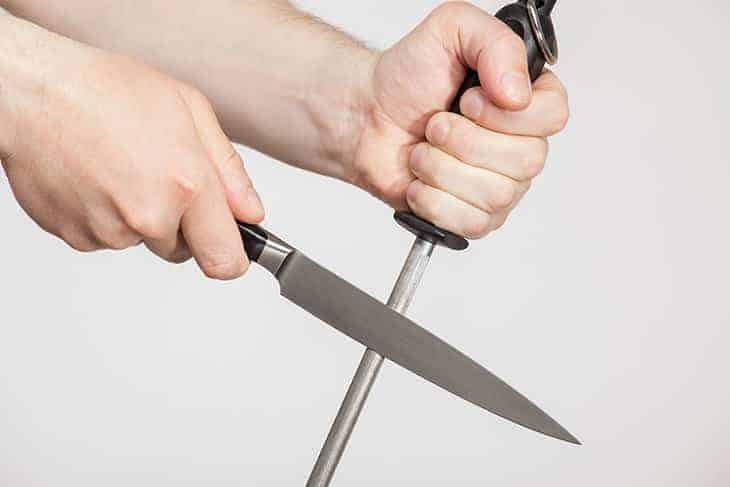 When you are sharpening your knife, you should never run it along the steel too roughly. Just do a slicing motion. Roughly running your knife on the steel would lead to further damage such as uneven chipping. You should also remember to only move your knife and never the steel. Most importantly, you shouldn’t move these two at the same time. Among all the steel sharpeners I have used, I would have to say that I highly recommend the one from Winware. Not only is it the most affordable, it also ticks off all the boxes when it comes to what a good steel sharpener should have. Of course, everyone has their own preferences but make sure that whatever you decide to get, you should not be looking at only one aspect of the sharpener. Make sure that the characteristics fit your needs and are compatible with your knife set. Ensuring this would save you both time and money and would make sure that your purchase is a smart purchase. I hope that you liked this article and that it would help you find the best sharpener for you. If you have any more questions, please don’t hesitate to comment them below. Do you think I missed out on a great sharpener? Do you have other tips that you want to share? If so then please comment them as well so more people will find out about it. Until next time, happy cooking! Are You Looking for the Best Portable Electric Stove?